History Prof. Paul Gillingham addresses a crowd at a discussion on President-elect Donald Trump in a global context. The event was hosted by The Buffett Institute for Global Studies. Panelists warned against romanticizing the U.S.’s pre-Trump past and remarked on the uncertainty of the country’s new administration during an event Thursday put on by the Buffett Institute for Global Studies. More than 100 people from the Northwestern and Evanston communities attended the event. It featured six Buffett-affiliated faculty who each specialize in different global issues and aspects of foreign policy. Panelists included history Prof. Paul Gillingham, Kellogg Prof. Klaus Weber and political science Profs. Ian Hurd, William Hurst, Galya Ruffer and Wendy Pearlman. The talk was followed by a Q&A. 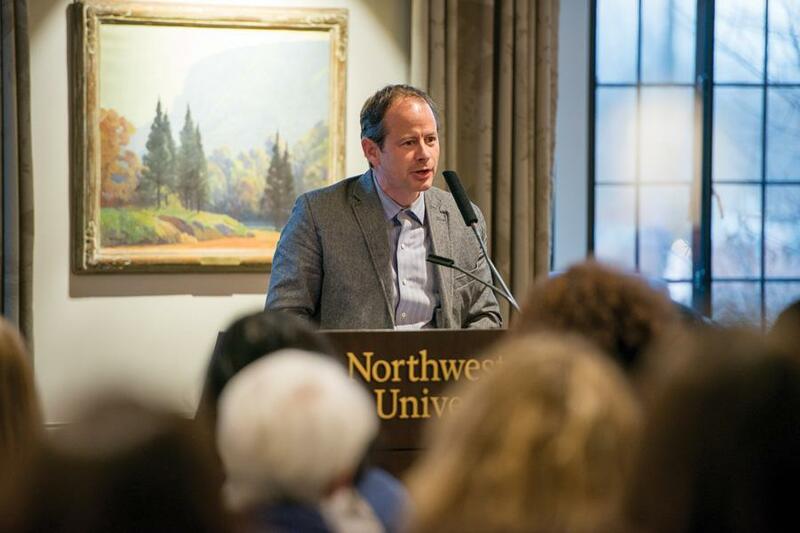 NU’s Institute for Policy Research had put on a post-election panel on Nov. 14 focusing on policy implications of President-elect Donald Trump. The Buffett Institute wanted to have a parallel post-election discussion focused on the international side of the implications, especially after the announcement of potential nominees in Trump’s administration, said sociology Prof. Bruce Carruthers, director of the Buffett Institute and the talk’s moderator. Several panelists commented on the lack of certainty surrounding the next administration’s policies, warning against getting caught up in Trump’s own words during the election. “The first thing I would do in thinking about issues … is separate out Trump the person, even Trump the president, from the broader machinery of American government policy,” Hurd said. Hurd said that despite Trump’s incendiary comments, he lacks a clear sense of existing U.S. foreign policy and likely does not have concrete plans for once he gets in office, Hurd said. Pearlman said although there are many “things to be depressed about,” attendees should not romanticize the country before Trump became president. She warned not to assume all conflicts abroad are directly the result of Trump’s actions. Carruthers said it is easier to make more judicious assessments of the coming administration as emotions have settled since the election. He said he was happy to see a large turnout and lively discussion with professors. “We have a lot of good, knowledgeable scholars who can help pull apart whatever kind of uncertainty or anxiety that people have about the administration and talk very concretely,” Carruthers told The Daily. Due to demonstrated interest in the global implications of the new administration, the Buffett Institute hopes to host more events and other public conversations on the topic, Carruthers said. Andrew Minik, a senior at University of Illinois at Urbana-Champaign who attended the event, said he appreciated being able to listen about potential international policies of the coming administration from people who understand the field. “(Trump’s) tweets say a lot, but it helps to have experts flesh out the policy implications of what he’s been saying,” Minik said.